Join the discussion on our forums! 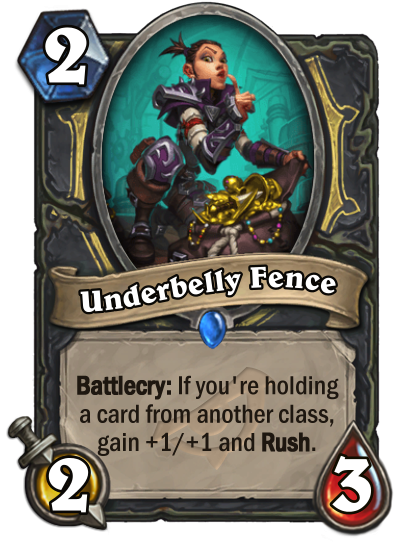 Come discuss Underbelly Fence over in our dedicated Underbelly Fence discussion topic. Battlecry: If you're holding a card from another class, gain +1/+1 and Rush. She’ll take anything you have—except scruples and a good work ethic. Great in arena, especially considering that most of the of burgle cards that rotate in (Blink Fox, Lotus Agents, and Undercity Huckster, for example) are all perfectly draftable on their own. The only option to play it on turn 2 after rotation is to play Pilfer the turn before. Or The Coin and Stolen Steel (not worth the Coin though). Or Preparation and Academic Espionage and then top-deck a stolen card but it’s much harder. Top card of this expansion IMO. Not only is the 2 slot wide open, but a 3/4 with Rush on turn two can be very hard to deal with. So good if burlge was right deck for Rogue. But Blizzard forgot about Miracle Rogue , it was the same with Control Warrior , they forgot and than bring it back (not with full legendary list, but it still looks good, even when epic cards do more work than legendary). Don't waste names like Mc'Donalds to mark brand of the socks or bottle of 1L of milk.